Using the web to gauge consumer interest is nothing new. Ford is trying it right now with their “Shape the 2011 Fiesta” quiz. 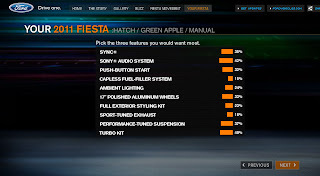 Visitors can select what options, color and transmission they want for their ideal Fiesta. It’s a great way to see what demand there may be for a new vehicle. The issue with the idea is will it attract future consumers or just auto enthusiast types who are more than willing to select a manual over automatic transmission for a dream Fiesta, but never really buy such a car? The hope, of course, is that those visiting the Fiesta pre-reveal site are truly considers of the product and will positively impact the production decisions as the car crosses the Atlantic Ocean to enter the U.S. market. Ford is evaluating quiz-takers by how they define themselves as “loafer or high-top” and “brand-new skateboard or brand-new golf driver”, in their “Choose Your Thing” quiz at the end of the shape your Fiesta poll. It’s an interesting approach and a commendable way to determine demand, provided potential buyers actually do find the site. I keep filling it hoping they’ll build a manual, hatch in Green Apple.